Praying with Our Lady in petition and thanksgiving. The meetings include song, the Miraculous Medal Novena, Respect Life Rosary and Novena, a prayer for priests and vocations to the priesthood, and litany of the most precious Blood of Jesus. We meet each week on Monday evenings from 7:00 – 8:00 pm in the Chapel. All prayer material is given out at the meetings. Mary educates us for peace and trust. In the words of Pope John Paul II, “Respect, Protect, Love and Serve Life.” Those looking to become new members should call individual on contact list. The active members participate in order to grow spiritually and pray for the intentions of the Blessed Mother. They visit the home bound, the sick, hospitals, and nursing homes. 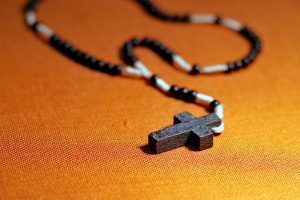 The auxiliary members pray the rosary at home or at church for the work done by the active members. There are weekly meetings and two hours of outside service for active members. This ministry meets to come together for prayer in the Holy Spirit. Our prayer group meets every Monday night in the Parish Center from 7:30 – 9:00 pm in room 114. We praise the Lord, we pray a healing prayer and then scripture. We also have a time of quiet reflection. We close the meeting with intercessory prayer. If you would like more information or to participate, contact those on the Leader list. This group serves the men of St. James by sharing everyday life experiences as Catholics and discussing how the gospel is part of our daily lives. The group meets on a flexible basis twice a month usually the first and third Saturday of each month. If interested contact one of the leaders on the list. The group meets once a month to create beautiful shawls and provide prayer for the individuals receiving the shawls. This is a time of spiritual refreshment: Bethany is a place and a time to rest and pray as Jesus did in Bethany at the home of Lazarus. Come together with your fellow parishioners meeting new people in your parish and hearing their stories of how their faith has sustained them through their life. This ministry assists in the cleaning and updating of all the linens for the church. In addition to the purificators and towels for the mass, they also see to the altar cloths. Each member does the linens for one month. Training is provided. If interested in becoming a member call individual on contact list. On First Friday of each month opportunities are provided for Eucharistic Adoration in the Chapel. Spiritual direction is an opportunity to have a spiritual companion, a trained spiritual director, walk with you, one on one, one hour a month to explore your faith traditions and to understand how Jesus is moving in your life. Serves married couples by providing them the opportunity to experience a weekend where the married couples have the chance to grow through a series of talks and workshops designed to enhance communication and intimacy. These talks are presented by three married couples and a Catholic priest. Interested couples should call individual on contact list. This is an open group that meets in the Chapel on Tuesdays at 7:00 pm. We have readings from the Diary of St. Maria Faustina and pray the Nine Day Divine Mercy Novena over a nine-week period. We also venerate Relics of various saints. All are welcome.